Georgia Tech researchers have demonstrated an automated system that uses artificial intelligence and image-processing technology to rapidly examine large numbers of individual organisms. 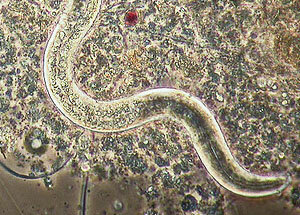 The researchers used the technology to study Caenorhabditis elegans, a species of nematode widely used in biological research, and found that the system's ability to detect subtle differences from worm-to-worm can identify genetic mutations that might not have been detected otherwise. By enabling thousands of worms to be examined autonomously in a fraction of the time required for conventional manual screening, the technique could change the way that high throughput genetic screening is carried out. The system relies on a camera to record three-dimensional images of each worm as it passes through the sorter. The system compares each image set against what it has learned the wild type worms should look like. It then "uses this information to determine what a mutant type may look like--which is information we didn't provide to the system--and sorts the worms based on that," says Georgia Tech's Matthew Crane. The machine-learning technology also could be applied to other areas of biology that use model genetic organisms.